Today’s project is soooo cute, and since I’m in baby mode this week I thought this project was very fitting! I came across the sweetest set of elephant baby wishes cards from A Creative Destiny and I couldn’t resist picking them up. I have a niece who is going to pop any time now and I’ll be helping my sister set up baby shower shop, so I thought a little baby wishes album to pass around would make a great keepsake! 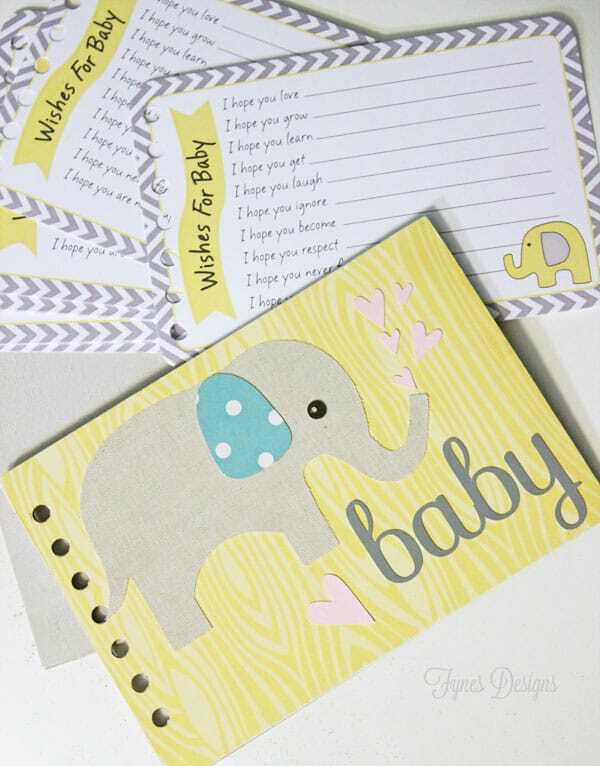 On my search for a cover design I found this oh so cute baby elephant from Miss Kate Cuttables that matched the baby wishes cards perfect! With the cut file in hand and using my Xyron 5″ Creative Station I was able to make this chipboard album in only a few minutes! 1. Cut 2 pieces of Chipboard (Cereal box works too) and 4 coordinating pieces of pattern paper, measuring 4.5″ x 6.5″. 2. Roll each piece of chipboard through the creative station. 3. 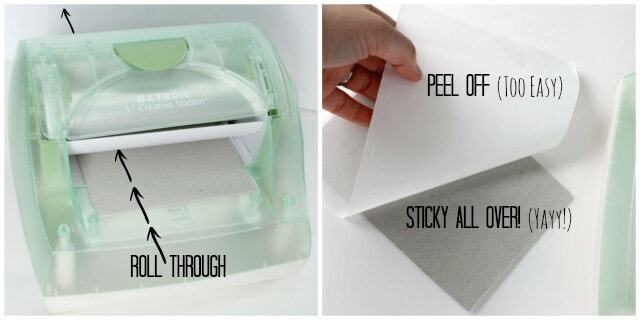 Remove plastic film from the top, and white paper from the bottom. Your chipboard will now be evenly sticky on one side. Adhere a piece of pattern paper to the sticky side. Repeat on each side of the chipboard rolling through with the ‘good’ side facing up. 4. Using your electronic cutter to cut the Miss Kate Cuttables baby elephant pieces and baby font. Roll those pieces through the creative station also. 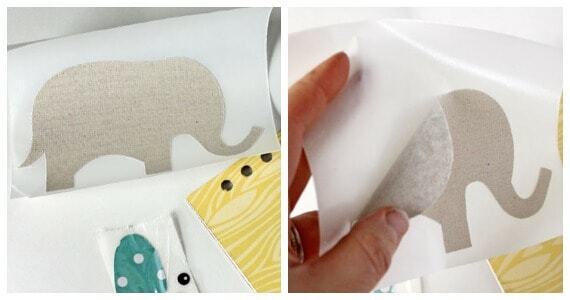 I used linen paper to cut the elephant body, Xyron works perfect for adhering fabric to paper. For the tiny pieces, like the eye and ear the 2″ Xyron Sticker Maker does a great job. 5. Using a binding tool (I have a Cinch), punch holes in the cards and the two covers, apply binding. If you don’t have a binding machine you could punch a single hole in the corner and use a binder ring to hold together. From here you can embellish your album how you desire. I added a few hearts and some May Arts bakers twine. 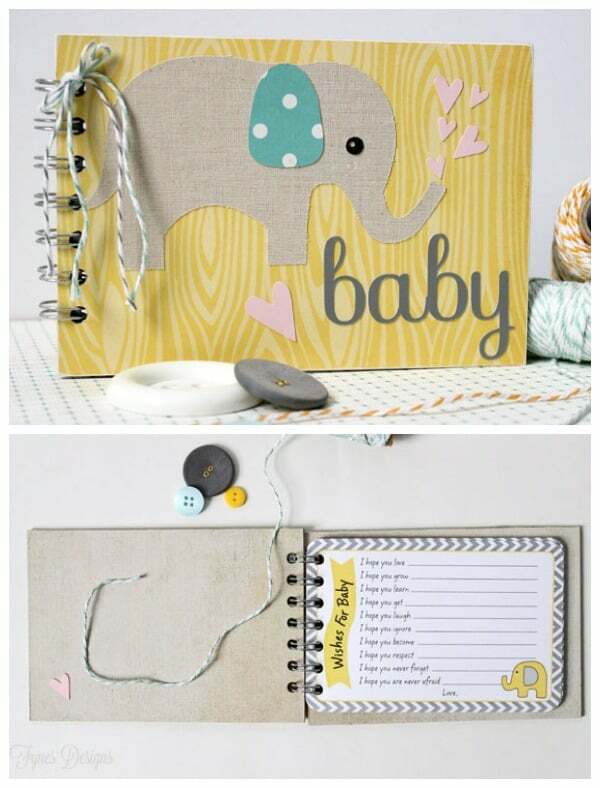 Won’t this Baby Wishes Album make the perfect activity for our Baby Shower?! This post is part of a week long blog hop for Xyron and Miss Kate Cuttables. Please visit their blogs for more fantastic inspiration! What a fun idea! Love it!! So super cute! It’s a sweet project for a baby shower ! 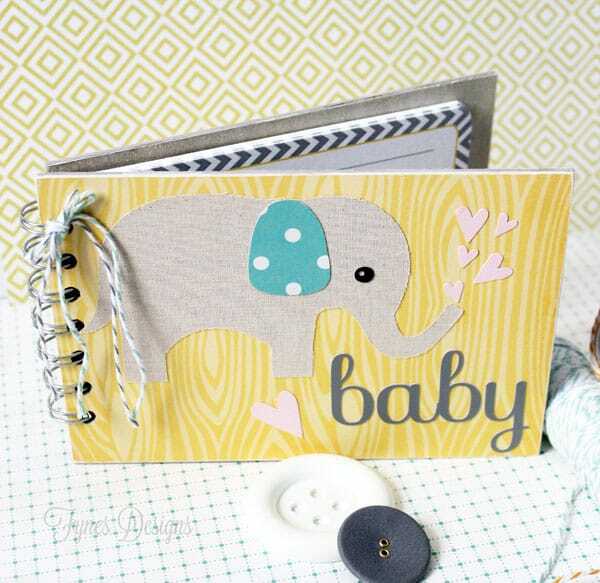 Such a cute little album … love the little elephant! This is adorable. I love the colours you have chosen. This is a clever idea and you did such a cute job on the cover and the inserts look wonderful. This should be a fun project for the shower. Good job on your tutorial for how you did your beautiful album. The Xyron products made putting it together a snap. I really LOVE this project! I am even going to “pin” it for later!!! what a cute cute design!! Thanks for linking up at Creativity Unleashed last week. Featuring you on the blog tomorrow and hope to see you back! Such a cute idea…I love it!! Thanks so much for sharing at Share The Wealth Sunday! Thank you for joining the Small victories Sunday linkup. Please join again. Pinned to the group board.